What Are PC Game Trainers and How To Use Them to Cheat In PC Games? – Useful tips and tricks, tutorials, workarounds, fixes, downloads and much more! What Are PC Game Trainers and How To Use Them to Cheat In PC Games? Game Trainer is a third-party program which runs simultaneously with video game and allows player to cheat and/or unlock specific game features and options. Every computer game uses memory addresses to store specific data related to currently running game, such as player health status, available weapons, ammo stock and similar informations. Trainer is programmed to change these data in order to suit player’s needs. How to use game trainer? Game trainers are usually designed to be simple and easy to understand for all kinds of gamer audience. Many trainers consists of only one executive file, but sometimes there may be couple of more files and libraries within the same folder. Almost every trainer comes with a detail explanation and usage instructions, stored in Readme.txt file. If there’s no Readme.txt, take a look for any file with .nfo extension and run it via Notepad or similar text editor. The usual procedure is to run the trainer and then run your game, while the trainer window stays active (sometimes it works vice-versa). Trainers are programmed to include a bunch of keyboard shortcuts, which can be used to toggle on/off various trainer features while you’re in game. Some trainers even offer an option to remap shortcut keys to accommodate player’s needs. Usually, you’ll hear a sound message when you activate each trainer option. Some trainers may automatically start playing midi music when started (may be pretty annoying and pointless), but there’s usually a button somewhere within the trainer graphic interface, to turn off this feature. If there’s no music switch button, it will probably stop playing when you start the game. How/where to find and download trainers? Game trainers are spread all over the Internet and finding them is more than easy. Just type the game name in Google, followed by the keyword “trainer” and you’ll get a bunch of results. For example “GTA V trainer“, will get you a huge list of sites offering trainer downloads for Grand Theft Auto V.
Almost every trainer name consists of game title, followed by a plus symbol (+) and number which represents the number of features included in specific game trainer. After the number, there’s usually a name of trainer’s author. This is a standard naming convention for game trainers. For example: GTA V +9 trainer by LinGon or Call Of Duty Ghosts +9 trainer by MaxTre. Are game trainers harmful for my computer? No, they are absolutely not, but you should definitely pay attention while downloading any kind of content from the internet. Many people tend to upload various kind of malware to their websites and smuggle it as some kind of harmless software such as game trainers. 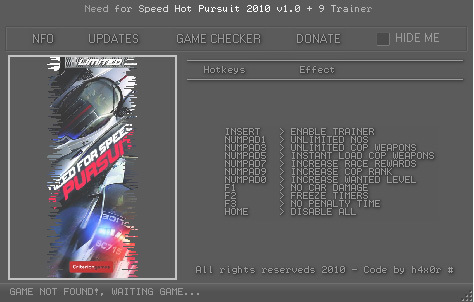 My antivirus detected game trainer as a virus! What should I do? This is a very common situation, which may be a false alert, which it is in the most number of cases. Game trainers, as explained before, change various memory addresses related to currently running video game, modifying the way game’s executables works. These actions are very similar to those performed by viruses, adware, spyware, trojan horses and any other kind of malicious software. This is the reason why your antivirus or firewall software may report downloaded trainer as an infected and harmful for your PC. If this happens, the best practice would be to avoid running suspicious file and search for another trainer, since there are no 100% effective methods to determine if it is a false alarm or real threat. Some websites may include additional informations about trainer, advising you to ignore any possible antivirus warning, but this may also be unreliable (depending on the website reputation). Who makes game trainers and should I pay for them? Game trainer are most commonly made by gaming community groups or individuals. Some of the most popular are: PiZZADOX, MaxTre, LinGon, FLiNG, h4x0r, MrAntiFun, DEViATED, DEViOUS, reVOLVeR. Almost all trainers are absolutely FREEWARE programs, developed for fun, not gaining any kind of profit to their Authors. There’s only one, well-known, trainer development group that sells their products and it is CheatHappens (cheathappens.com), but they also offer a bunch of free trainer versions (especially for older game titles).